Tui’s Rest is a comfortable and affordable bach. 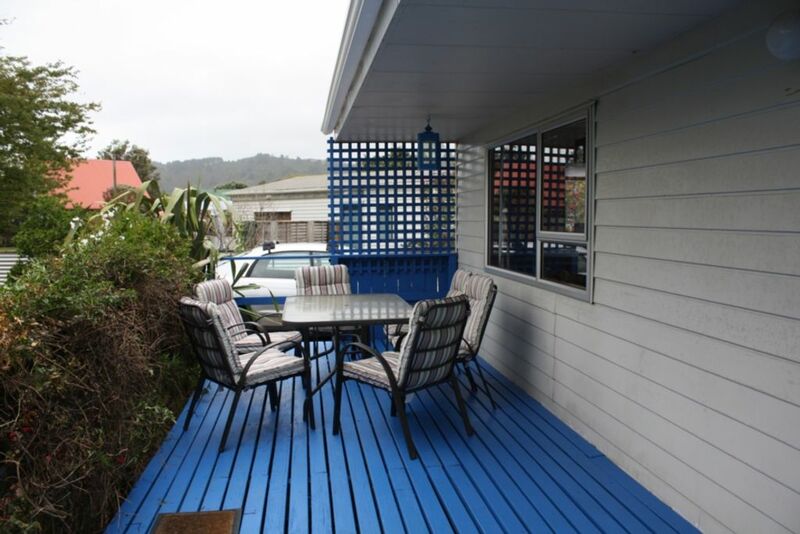 We are in a quiet location only one street away from the estuary (400m), and a short walk to the beach. We are also only a short walk to the golf course and the Estuary Store/takeaways. Popular with young families, our yard is private and fully fenced, with plenty of room for the kids to play. We have a gas BBQ and outdoor setting on the large deck. The Smart TV has freeview, AVI player, and connection to your YouTube/ Netflix account, plus DVD player. We have a good collection of books, games, toys, blocks, and puzzles. We have a kayak, kick scooter, and a beach cruiser bike for renter use. We have a great heating system to keep you toasty in the winter, in both the house and sleep-out. We find the beds comfortable, and have a new master bed in 2015 three new single mattresses in 2014. Dolce Gusto Coffee pod maker available. BYO pods. This is a comfortable family bach. If you are expecting hotel quality please book elsewhere. I have a property manager who responds promptly to any issues you may have, but this is not the same as staff on site. The bach has 2 bedrooms inside, plus the sleep-out. The house and sleep-out are insulated and in good condition. All beds have duvets and pillows. The fencing is not dog proof if your dog is determined to escape. Please bring rope if you will be leaving your dog unattended. The yard has trees for shade. WHAT TO BRING: The bach is self-catering with regards to linen. Bring your own sheets, pillow cases, towels, hand towels, and tea towels, toilet paper. There is a washing machine and dryer. Linen hire can be provided by my property manager for $20 per person which includes: Sheets, pillow slips, bath towels, bath mat, hand towels, beach towels and tea towels. Please contact me if you would like to hire linen, the fee system on HomeAway doesn't currently support per person rates. Rent negotiable during winter months, May-Nov for long term stays of 3 months plus. PARKING: There is off-street parking for two vehicles in the driveway. There's plenty on-street parking also. ** DOGS: On negotiation only. Our property manager uses her industrial vacuum to remove pet hair after your visit so a $25 extra cleaning charge applies. Please let me know how many dogs you want to bring. Please remove your dogs deposits so the yard is clean for the next family. **No tents or caravans. No camping. I love Whangamata with a passion. This house appealed to me as it has a fully fenced yard on a private site, and is insulated. In a bach town those things can be hard to come by. Its in a quiet street, close to the estuary. At night when the air gets still you can hear the ocean. Its my little slice of heaven. We have a plum tree, feijoa, guava, lemon, and a very young apple tree. The site has shaded places to sit, and plenty of outdoor furniture. Its a short walk to Blackies cafe in Williamson park, or the estuary. To swim between the flags on the main beach by Williamson Park its 1.6km. To swim at the closer spot near the Estuary Store and Takeaways its 1.3kms. The Otahu Estuary is a short walk of 700m. Linen hire is provided by my property manager at $15 per person. Please arrange this with me. The driveway can hold 2 cars. There is parking available on the street. Nescafe Dolce Gusto pod machine. Coffee plunger also. One kayak and paddle available. There are hire places in town for paddleboards, kayaks, and bikes. Thanks so much Phillip, we would love to have you stay again should you wish. We appreciate your compliments. Cosy bach for any means. Very private too. Great value for money. Very tidy ,well equipped bach. Thanks very much Kerryn, we would love to have you again should you wish. We try to keep it affordable for the average Kiwi, thanks for your comments. We thought the house was clean and tidy and welcoming.Just one thing could have improved. If the lawns were done prior to each tenancy it would be tidier and add to the general appearance of the place.